Normally, the answer is simple in Hyrule. When something bad happens, the culprit is usually a single villain. Who kidnapped your sister? Ganon. Who stole the Triforce and is trying to take over the entire world? Ganon. Who said mean things to Tingle to make him cry? Yeah, you guessed it. Ganon (although on occasion Vaati has been known for his mean deeds too). 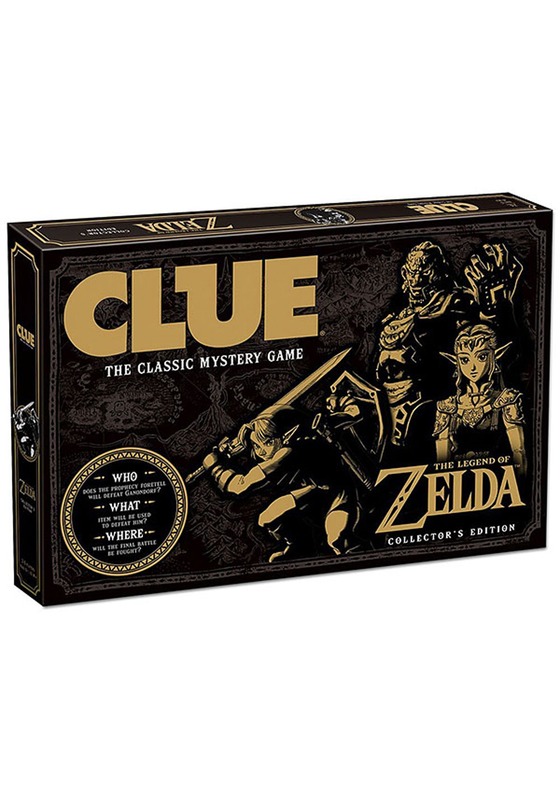 The good news is that this CLUE: Legend of Zelda Edition doesn’t ask players who the baddie is. Instead, all of you will be searching to find what special item is capable of defeating Ganon and who is in possession of the said item. This CLUE Board Game comes with everything you need to play. It has a Hyrule themed board game with various locations from the video game. It comes with character cards, game pieces, dice, and cards. It’s much like a normal game of CLUE, where you attempt to acquire clues to figure out the who and what to win the game. Each character does have a special power, which makes gameplay a little more robust compared to classic CLUE gameplay. So, is it Link with the Hookshot in Gerudo valley? You’ll have to uncover the clues to find out!